Kathleen was born in the home of her parents, then at 18 St James Street, Scarborough, on 31st August 1913. After a few months the family moved to 36 Cambridge Street where Kathleen lived until her marriage. Kathleen attended the Central Infants School from the age of 5 and later attended the Central Girls School where she played netball for the School and obtained a Certificate for Proficiency in Needlework, Practical Cookery and Domestic Economy on 31st July 1927. She had earlier been awarded a Certificate for excellence in reporting a lecture on “The Hygiene of Food and Drink” by the Yorkshire Band of Hope Union on 11th July 1927. On leaving School in the Summer of 1927, Kathleen went to work in Thompsons Cake Shop in Victoria Road, Scarborough. After six months, she developed yellow jaundice and was ill off work for some months and did not return to Thompsons. After a year, part of which was spent as a “young lady of leisure”, she started work as an apprentice with the M & B Company - a Lady’s Fashion Shop in York Place, Scarborough, owned by a Mr & Mrs Goss. She modelled the clothes for customers in the shop and worked there until 1937. Over the ten years from 1927 to 1937 Kathleen’s major interest was ballroom dancing and she frequently attended dances in Scarborough at The Spa and The Olympia; also at The Royal, Grand and Cumberland Hotels. After her marriage Kathleen moved with Ron into his mother’s house at 2 Rothbury Street, Scarborough. 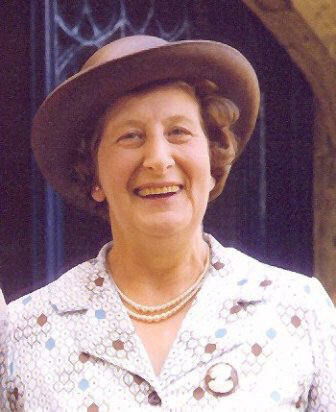 When Ron joined the Army on the outbreak of War, at Ron's request, Kathleen lived, until after the end of the War, with the children and Ron’s mother, also to look after Ron's mother, who was far from the easiest person to live with, although she was very good to Terry and Pamela when children. A distinct memory of Kathleen at this time was the frequent need to move to the Air Raid Shelter at the bottom of the garden, as German bombers flew over Scarborough. During the War, Kathleen organised a number of events to raise money for "soldiers comforts", at St Saviours Church Hall and she frequently travelled to Leeds and York and further away to such places as Ashford in Kent and Weybridge in Surrey to be with Ron while on leave. On Ron’s return from duty with the Occupying Forces in Germany, The family moved to their first own house - 31 Warley Drive, Bradford Moor - in 1946 and it was to this house that their second daughter, Elaine, was brought, after birth in a Nursing Home, on 24th July 1949. Soon after moving to Bradford, Kathleen went to work for Barnett & Huttons, which was a Ladies Clothes shop, for a few months and then worked for Kinos, another ladies shop, as first Sales Assistant, until just before Elaine was born. She always had a keen interest in beautiful clothes and travelled miles to buy them. They also had a keen interest in tropical fish and kept quite a number in tanks built by Ron; with the collection becoming too large for the house, Ron rented 62 Leeds Road in Bradford, a shop, for them to keep her fish and sell fish and aquatic supplies three days a week from 2.00 until 700 pm. The shop was know as "Exotic Aquaria Supplies". On Coronation Day in 1953, Terrapins escaped from a window display into the Leeds Road - the police arrived to ensure they were collected. The whole family helped to make fish tanks and to use in exhibitions at the Bradford Aquatic Society. The shop was very successful, but had to be sold when Ron’s job necessitated a move from Bradford. In 1960, this change of work took Ron, Kathleen and Elaine to 20 Oakroyd Avenue, Dunmow, Essex; Pamela had married in Yorkshire and Terry was settled into his career in Yorkshire. In 1963 the family moved again, to 4 Green Lane, Martlesham, Suffolk. In 1964 a further change of Ron’s work took the family to 56 Howard Drive, Letchworth, Herts, where they lived until 1985, although Elaine left on marriage in 1969. Soon after moving to Letchworth, Kathleen joined Letchworth Flower Club, which had been an interest of hers until her move to Renhold. Kathleen had a number of life long friends as she moved around the country, most of whom died before Kathleen. In 1972, Kathleen went to work for Ron at his factory, York House, in Dunstable, where she continued, travelling every working day to Dunstable, until illness caused Ron to sell his business in 1978. When Ron was active in the Freemasons, from his time in Bradford until about 1980, Kathleen particularly enjoyed the many Masonic Ladies Nights she attended. Additionally, she enjoyed the staff functions organised by the firms for which Ron worked. Since selling the factory, Kathleen and Ron had been retired and enjoyed the company of family and friends. Ron’s illness did little to diminish their social life and holidays, which included trips to America and Europe. In 1985 Kathleen and Ron moved to 27 The Dale, Letchworth and in the same year Kathleen joined the Committee of the Letchworth Flower Club on which she still served until 1999. Following Ron’s death in 1991, Kathleen lived alone at 27 the Dale until she was persuaded by her family to move to Renhold to be near her daughter and son in law, Elaine and Rob. On 1st June 2000 the sale of 27 The Dale was completed and Kathleen moved in with Elaine & Rob until the completion of the purchase of 13 Wilden Road, Renhold on 16th August. 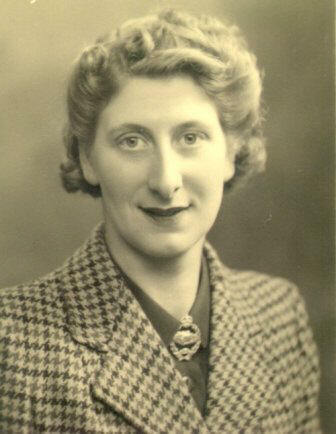 However, Kathleen did not move into her new home until 30th September after the completion of work to the bungalow. Since moving to Renhold, Kathleen attended All Saints Church and joined the monthly Luncheon Club at the Church. She also joined, for a short time, a Club of Village widows who met for lunch or coffee once a month. However, in March 2007 she fell and broke her pelvis; following treatment in Bedford Hospital she entered Brookside Nursing home in Risely because she needed more care than could be given at home. After a few weeks she fell again and broke her hip, returning to Bedford Hospital. Following an operation her health deteriorated, but, when able, went to Crossways Nursing Home in Hookhams Lane, where she could be given constant necessary care. Initially she was able to sit in the lounge of Crossways, but her health so deteriorated that she was confined to her bed and sadly died on 2nd July 2007. Her funeral was held at All Saints Church, Renhold on 25th July followed by cremation at Bedford Cemetery. On 14th August, her ashes were interred with those of her husband, just beneath the East widow of St Mary's Church, Old Letchworth.